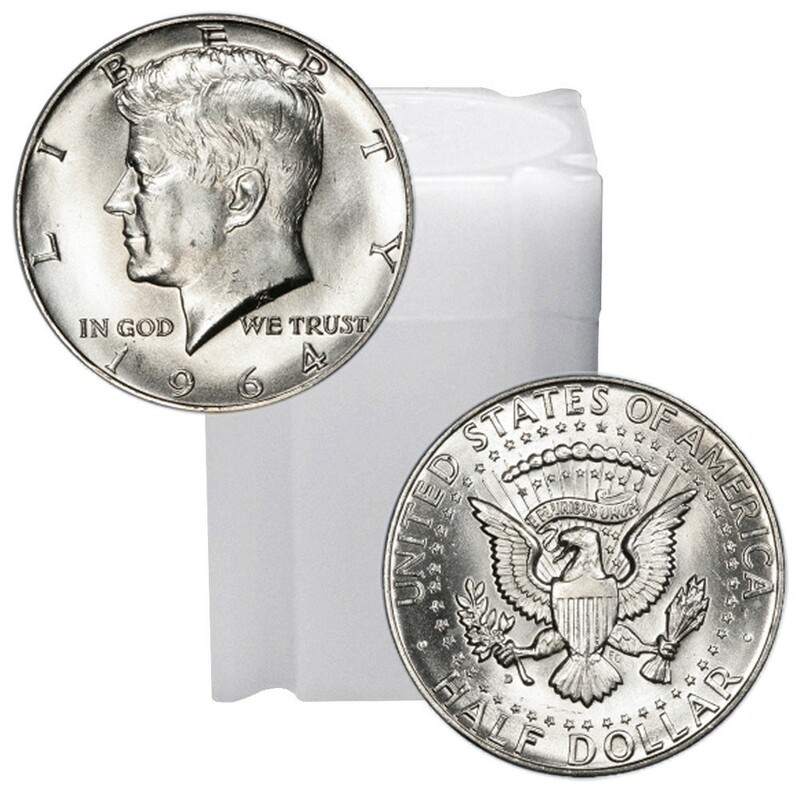 Even though modern circulating coins are no longer made of silver, you can still purchase these 90% silver Kennedy half dollars, which were only produced very briefly. Silver half dollars were common in pocket change until the 1960s, when wise collectors picked them out of circulation and the US Mint eliminated silver from American coinage. They are still prized by both collectors and investors. Legal tender coinage produced by the US Mint in 1964. Silver was removed from most US coinage the following year; 1965 and later Kennedy halves contain 40% silver. Packaged in convenient tubes of 20 ($10 face value per tube). However, circulated 90% silver coins are still traded as an investment product around the world. These coins are sometimes referred to as “junk silver” because they are in circulated condition, but make no mistake: they are a wise investment, indeed. If you put away a paper $10 bill in 1965, you’d still have $10; but a roll of 1964 Kennedy half dollars is now worth many, many times that! The Kennedy half dollar replaced the Franklin half dollar shortly after JFK's assassination in November 1963. The new coins were immediately swallowed up by collectors upon their release in March 1964. By this time, the rising price of silver was driving most silver coinage out of circulation, and despite a huge production run in 1964, these half dollars almost never circulated. To solve the problem, the Johnson administration removed silver from most US coinage for 1965; the silver content of the Kennedy half dollar was reduced to 40%. As a result, 1964 is the only year that 90% Kennedy halves were produced for circulation. These half dollars are packaged in convenient tubes of 20 coins apiece. Each tube contains $10 face value worth of coins, just like once-common rolls of silver halves. There is approximately 7.15 troy ounces of pure silver in each tube. These tubes are an affordable and popular way to own low premium silver. Larger bags of $100 face value are also available.